Our price matching service runs on a like for like basis, if you find the same product that has the same aspects as ours e.g. same quality and print quality then once you have purchased for full price we will then refund you the difference once we have proof of the price you have found. All orders are taken via our website www.designasign.co.uk which is owned by Ebox Media Ltd. It is the customer’s responsibility to notify us of any errors or changes required within 24 hours of receipt of confirmation. It is the customer’s responsibility to advise us of non-receipt of the confirmation e-mail. Any colours, shapes and sizes may differ from that shown on the website due to visual translation from real products and the use of natural materials. It is the customer’s responsibility to ensure that their substrate, shape, layout, text, and font are correct before proceeding to payment. It is the customer’s responsibility to check their artwork and make sure it is of a correct size, we can help with this using our free design service but once a project is signed off by the customer it is their responsibility. It is the customers responsibility to also take into account the print quality of the substrate they are purchasing we colour match artwork as close as we can but different materials will give different quality print results. We reserve the right to alter the customers designed product if we feel production may be hindered due to sizing or layout limitations. Any colour samples shown on screen may differ slightly from the physical colour of the material due to different screen resolutions and colour settings. Colours shown on screens are digitally enhanced by contrast conditions on the computer or device being viewed upon. Upon approval via email of the proof given towards your order, once manufacturing has begun the item becomes non-refundable as all our signs are individually personalised to the customers requirements and as such they are not eligible for return, refund or exchange. As our website vistors are both public and commercial customers all prices stated are shown exclusive and inclusive of VAT at the current rate of 20%.Please refer to your confirmation e-mail for a VAT invoice. Our express delivery option means items are usually dispatched in 5 working days, delivery is usually next working day but may take longer. All items (unless Special Delivery is selected) are shipped using APC which can sometimes require a signature. If special delivery is selected or the item is larger than the couriers will accept delivery will be made by our own fleet of drivers. All postal costs are specified on payment. Free delivery applies to all orders with a minimum order value of £50.00 inc VAT with the exception of large items and items that require special/fleet delivery. Please see here the list of items that are excluded from our free delivery; Illuminated Signs, All signage where the tiled panel size is larger than 1220mm either length or height. Excluded delivery locations from our Free Delivery are as follows; Highlands and Islands including; Jersey, Guernsey, Scotland Highlands, Isle of Wight, Ireland & Northern Ireland, Isle of Mann. 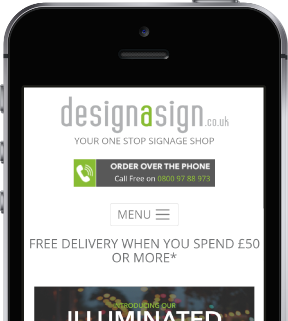 designasign.co.uk will not be responsible for any spelling mistakes or typographical errors made by the customer. The customer shall indemnify and keep indemnified Ebox Media Ltd and www.designasign.co.uk against all claims, costs, demands and expenses against the Company or any of its employees, howsoever incurred, arising out of the printing or distribution by the Company of any matter that is or may be unlawful, criminal, tortuous or libellous, or that infringes or may infringe any copyright, patent or design. With the new General Data Protection Regulation being introduced as of 25th May 2018, here we lay down our process to how we store and handle customer data/information. We, as the “Data Handlers” store customer data supplied to us by the consumer at checkout stage of our website. This information consists only of the following; Name, Email address, Billing/Delivery address, and Phone number. Any payment details are managed by third party subcontractors “Data Controllers” WORLDPAY, PAYPAL. Delivery details are then managed by ourselves and shared with required couriers; Royal Mail and APC Overnight. Each third party subcontractor we entertain, are committed to keeping your data confidential. Data stored by ourselves is removed and destroyed after 3 years (due to certain guarantees we offer). During this time, if you wished for your information to be deleted, you must provide notice of this request to us. Your information will then be removed from our database. All images, designs, data and text are the reserved property of Ebox Media Ltd and www.designasign.co.uk.